Look near Gadsden, Alabama and you will see Neely Henry Lake. It runs right alongside the city’s major highway’s in downtown Gadsden, just a short distance away. This is another Coosa River Impoundment left down till mid-April. It is also worth mentioning a word of caution for first timers, when navigating Neely Henry’s waters during winter pool. 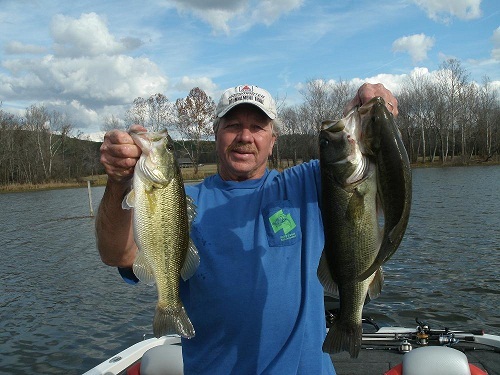 There are some big largemouth’s and huge Coosa River spotted bass taken from Neely Henry lake each spring. Fishing a low water, “wood and rock pattern” in March, can lead into fishing new growing aquatic weeds by April into the end of May. Above Gadsden City boat launch is mostly narrow, river-type fishing conditions. Downriver, the lake widens with many feeder creeks, small cuts, pockets and main river flats. Water levels play an important role in March, especially on Neely Henry Lake. Often the lake is down from 1-4 feet during winter and on into early spring. Usually around 1-2 feet down is normal late winter low water levels. Other factors determine your fishing success in March. 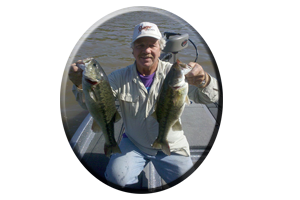 Such as cold fronts, muddy water, water temperature, heavy rains and the availability of baitfish and crayfish. Soft plastics are great lure choices during these slow, cold water times. Above Gadsden City launch on Neely Henry Lake, is considered upriver, which consists of a narrow, winding river with few, if any backwaters, during winter pool. There are some small feeder creeks with flats that heat up during the warming trends of March. Most backwaters upriver (all but Cove Creek) are dry from midways to the far back ends, until the lake is returned to full pool in May. The mouths of these feeder creeks, small cuts, pockets and main lake flats, all harbor baitfish, attempting to escape the sometimes swift current during March. There are also pre-spawn bass, of both breeds, seeking wood and rock cover, within slack current areas, for ideal ambush spots in these hideouts. 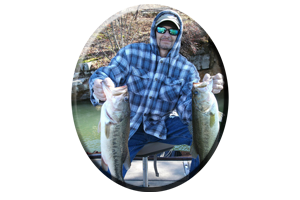 Another good area to concentrate your fishing efforts is along rocky, outside river bend bluffs, for some line-stretching spotted bass. These Coosa River spotted bass, will actively chase lures such as crankbaits, jerkbaits, spinnerbaits and even topwaters. Usually best, when conditions are warming, the water is clear to lightly stained and in the 60′s. Downriver, many feeder creeks such as Canoe Creek and Beaver Creek, have stump-filled flats and most display winding feeders. Most creeks are still navigable, but with extreme caution, during low pool. Look for baitfish, clearing water conditions, good spawning habitat and the warmest water available, for actively feeding bass during March. In both upriver and downriver situations cold, stained water, often means having to fish slower with bottom dragged lures like worms, lizards, crayfish imitations, creature baits and both Texas and Carolina-rigged plastics, for fooling numbers of bass. The jig and pork (or plastic trailer) combo is always good for that Big bass bite, especially during the cold days of March. Tube baits are always good for prespawn bass. Both lures simulate crayfish and color choice should vary with brown, green, black and touches of blue, purple, red or orange. Rattles and fish attractants, aid the bass in finding these and other lures, during stained water conditions. This is the month lake levels return to full pool. 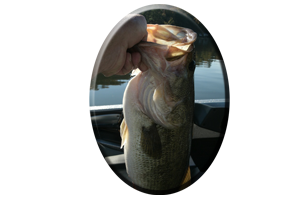 By the third week of April, the bass will be in some very shallow water, especially with rising water conditions. Spring rains can create stained or muddy conditions at this time. This gives bass a sense of security, as they move about in shallow water to feed and spawn. 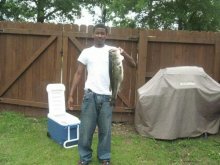 As lake levels begin to rise, so do the bass. During these warming trends many male and female bass will be in less than one foot of water. Stealth is a must. Some female bass will lay their eggs on or near a full moon then recuperate holding in some nearby cover around these spawning areas. Other bass just suspend, out away from the cover, to relax a while, from the rigors of spawning until they regain their strength. Cold fronts severely affect these bass and it can temporarily slow the spawning process. Bright, bluebird days following these cold fronts always create a slowdown period. This is when you have to slow your lure presentation and fish drop-offs and ledges near prime spawning grounds. Or you can choose thick wood cover in shallow water, that often holds some schools of big bass during high pressure conditions in April. Coaxing these sly bass from stumps, brush piles, laydowns or out from beneath piers and boathouses, calls for stealth, accurate presentations and correct lure choice. 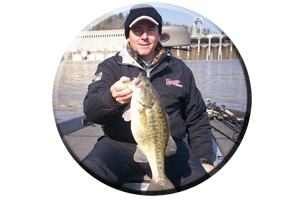 As Neely Henry returns to full pool, look for bass in newly growing weeds by the end of April. 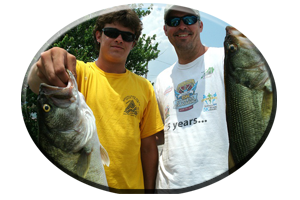 Best lures are mentioned in the following Neely Henry May tips. 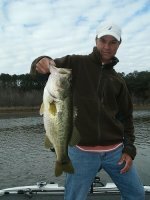 May, on any Alabama lake, means topwater time with fast, furious action from hungry, post-spawn bass. On Neely Henry lake bass of both species invade the newly flooded backwaters, to feed and complete their spawn, as the lake returns to full pool. At this time, many small, male bass protect the beds and they will nail a buzzbait. Some bass will be very big and some are big, very irritated female bass. Lures such Zara Spooks, Baby torpedoes, Pop-r’s, Spittin’ Images and other noise-making topwaters like chuggers, prop-baits etc., will entice a strike as well. There are also some of the year’s biggest female bass taken in the month of May. While fishing around thick, shallow weeds, brush and wood cover on spawning flats, there are bass, that can create some mighty surprising blow-ups, during the late-April to late-May period. By mid-May there will be some new grass, well-established in small pockets, creek backwaters, and on creek and main lake flats. Post spawn bass will lay in six inches of water around this new, green growth during these times. This thin-growing grass, calls for a variety of weedless, shallow water lures fished on or near the surface. Floating worms have won major B.A.S.S. and FLW tournaments on Neely Henry lake during Spring. So have buzzbaits, floating lizards, soft jerkbaits, frogs and rats, and weedless spoons, all fished in and around these new green homes of hungry, post-spawn bass. Spinnerbaits, worms, lizards, jig combos, grubs, gitzits and tube lures, are just a few of the excellent lure choices for these weeds. When fished around brush, stumps and other wood cover, during the post-spawn period of May, all of these lures can produce violent strikes. Many bass suspend or hang away from the banks in May. Always include fan-casting an area with suspending and floating jerkbaits. Also try shallow-to-mid-running crankbaits, spinnerbaits and rattling lipless lures such as rattletraps and rattlin’ spots. For explosive topwater strikes, try “Zara Super Spooks”, Buzzbaits, Frogs and Rats, and swimming worms, lizards, swim baits and creature baits on or near top as well.